President Donald Trump said his 12-day trip to Asia resulted in a lot of progress on trade and North Korea. Fresh off of his 12-day trip to Asia, President Donald Trump held a press conference to talk about how things went overseas. Trump said, "Over the last two weeks, we have made historic strides in reasserting American leadership, restoring American security and reawakening American confidence." Trump's main talking point was his effort to rally world leaders against the threat of North Korea's nuclear program. Japan announced new sanctions targeting North Korea during his visit, and China said Wednesday it will send an envoy to North Korea to reopen talks with the isolated nation. Trump also said his trip was a big success in regards to trade. 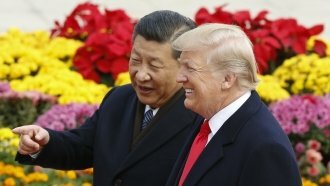 "I announced that the United States is ready to make bilateral trade deals with any nation in the region that wants to be our partner in fair and reciprocal trade," Trump said. But the U.S. didn't secure any new commitments on bilateral trade deals during the trip — in fact, Japan has taken the lead on advancing a major 11-nation trade agreement that Trump previously withdrew from. Still, Trump seemed confident that he delivered a message of American strength and prosperity abroad. Hopefully he was better hydrated for those talks.